Diving into buttermilk 101 – A fun visual guide to buttermilk including what it is, what it does in baking, and exploring side-by-side substitute comparisons. When it comes to the baking questions I get asked most frequently, substitutions is definitely one of the major themes. 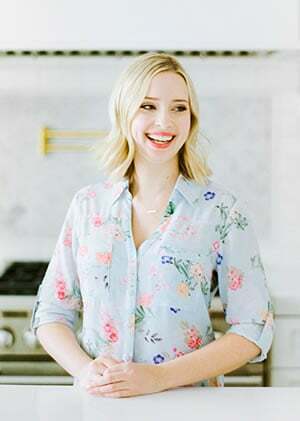 Whether it’s due to food allergies or intolerances or lack of availability or convenience, I know it’s not always possible to have or use every ingredient on hand for a recipe you might want to try out. Answering specific substitution questions becomes challenging, however, when I haven’t tested a particular substitution for a particular recipe. It makes me uncomfortable to answer these types of questions because I simply don’t have 100% confidence to say a substitution will definitely work or not. That’s actually why I created my Baking Substitutions guide. It’s a super handy resource for those times when you don’t have a particular ingredient on hand. However, even thought it took me weeks to make that guide I still haven’t tested every substitution instance or done in-depth side-by-side comparisons. That’s also why I love to do these kinds of baking experiments. It’s so hard to judge the taste and texture of a substitution without testing it directly next to the original, or the “control.” And since buttermilk is an ingredient I get asked about a lot, I thought a Buttermilk 101 post would be a perfect reference for your own baking experiments! If you like these kinds of posts then you’ll LOVE The Magic of Baking online course + community I recently created. It dives deep into baking science in a fun, visual, & approachable way so you can enter the kitchen with complete confidence. I made every effort to replicate each batch as perfectly as possible, using the same exact tools and ingredients whenever applicable. I used a kitchen scale to measure ingredients to ensure 100% accuracy and used an oven thermometer to gauge exact baking temperatures. Each batch was baked for exactly 13 minutes. Originally, buttermilk was the leftover liquid produced following the churning of cream into butter. Modern buttermilk is now made by adding lactic acid to milk (usually lowfat milk) to “culture” it. The acid affects the casein proteins, and that’s what produces the thick texture of buttermilk. Buttermilk is used primarily for its pleasant tangy flavor, but it can also help tenderize and leaven certain baked goods. When it comes to buttermilk, the most common question I get is how to best substitute for it. I get it, most of us don’t have “real” buttermilk in our fridge all of the time and running back to the grocery store for one or two things can be such a hassle. However, since I know from all of my Ultimate Guides, one small change in a baking recipe can have significant results. So I decided to put the most common buttermilk substitutions to the test. 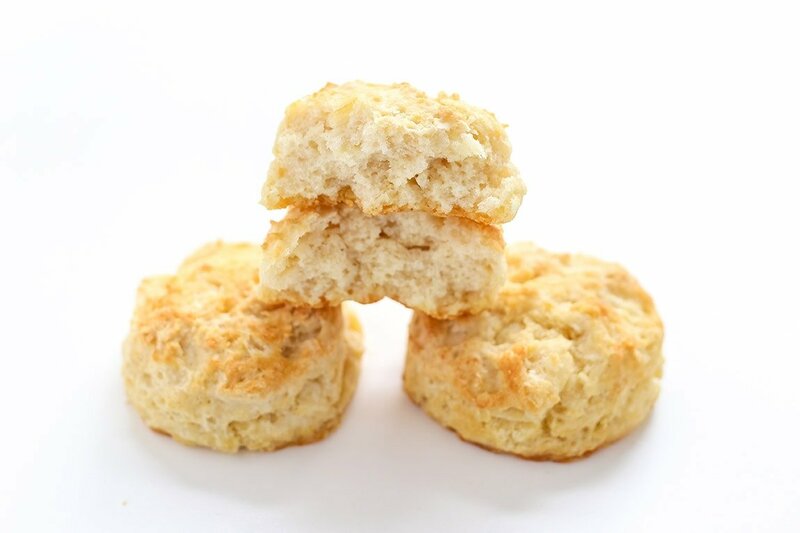 All of the biscuits I baked were based off my go-to biscuit recipe found at the bottom of this post. I re-made the same recipe each time, simply changing out the buttermilk for each batch. 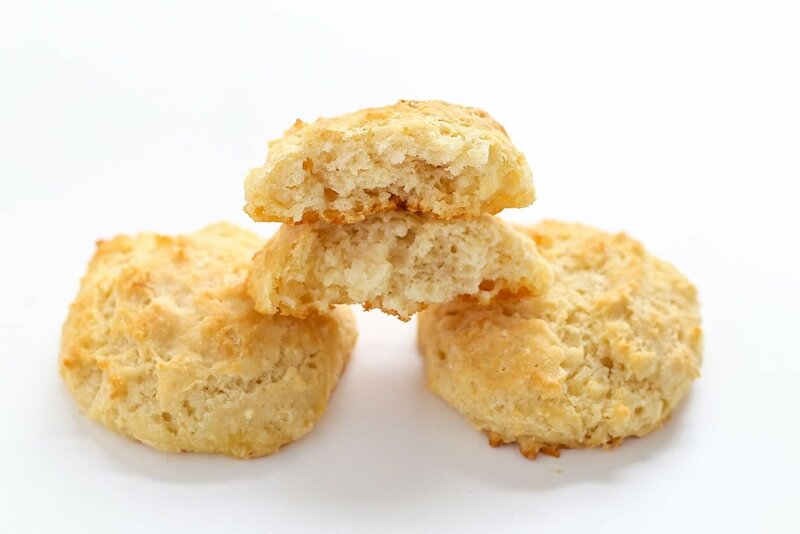 These control “real” buttermilk biscuits were exactly as I anticipated: tangy, buttery, tall, appealingly craggy, with a coarse open crumb. These represent why I love buttermilk so much! The flavor was fantastic. I combined the two and let sit for 5 minutes before mixing into the dough. The mixture was definitely thinner than actual buttermilk, and the dough was much wetter and sticker which made it more difficult to work with. 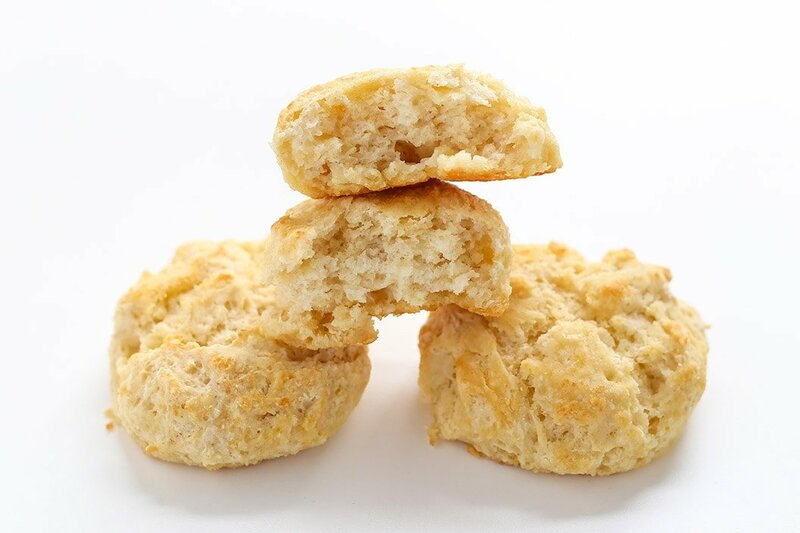 I was super excited to do a direct taste test with these biscuits compared to the “real” buttermilk biscuits. When I pulled these out of the oven I was impressed by the lovely brown color they had developed. 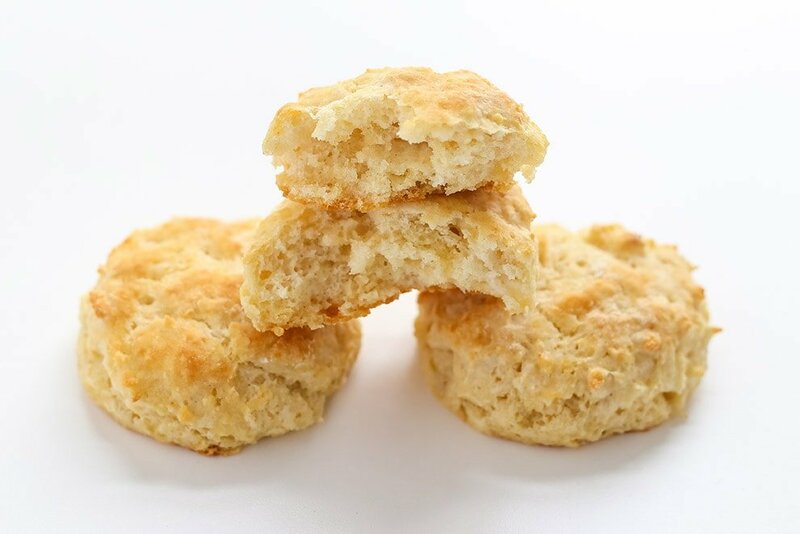 Unfortunately, the DIY buttermilk noticeably lacked the complex tangy flavor of the control buttermilk biscuits and instead contained a sharp sourness. They also had a finer crumb which I found to be more similar to store-bought or fast food biscuits. I used the Saco brand of cultured buttermilk powder that I found at my grocery store and followed the substitutions directions listed on the packaging: 1 cup water + 4 tablespoons powder. I used filtered water. The package directed me to blend the powder into the dry ingredients, which is what I did. Where the control biscuits were pleasantly tangy, these biscuits were strangely sour. They also baked up flatter than the other batches. The package directions also said to refrigerate the powder after opening, which to me doesn’t make it all that much more convenient than actual buttermilk, especially for the amount of flavor you’re giving up to use this. 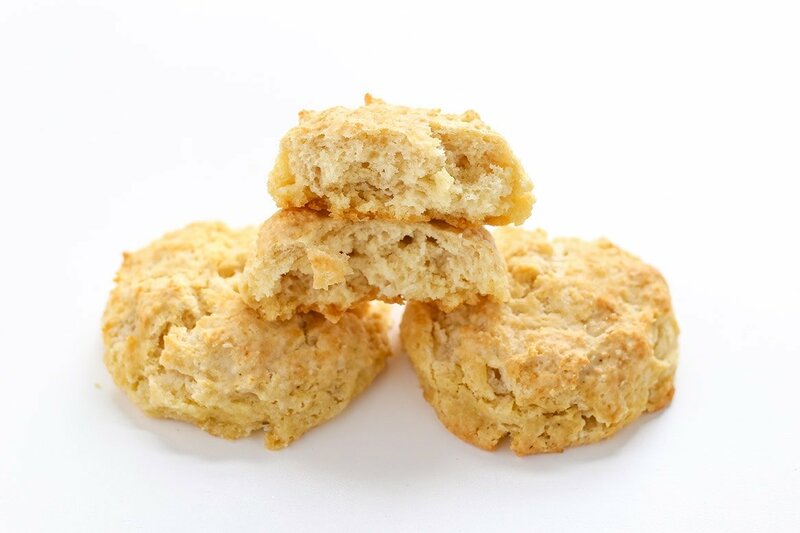 These biscuits turned out craggy and nicely golden, and had an intense buttery flavor. They tasted the most buttery of all the batches, which makes sense considering there was no acidity here to cut through the fat and richness. These also had a finer crumb similar to the DIY buttermilk biscuits, which was interesting. I thinned the yogurt considerably with water until it was pourable before adding into the dough. Surprisingly, these biscuits ended up being my favorite behind the control batch. They had good flavor and a tall even shape. The only downside was that similarly to the DIY buttermilk biscuits, these had a finer texture similar to fast food biscuits (think KFC). However, because I know some people enjoy that texture using plain yogurt might be a great option for you! I combined the two and let sit for 5 minutes before mixing into the dough. I did *not* substitute the dairy butter in this batch because I wanted a direct comparison against the control batch and because this post is all about buttermilk. 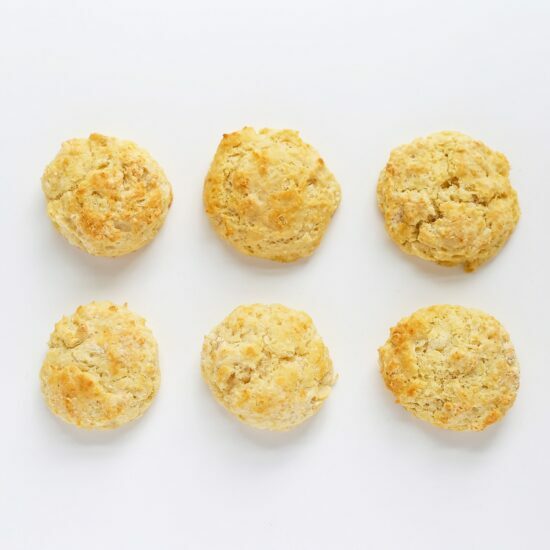 Check out my biscuit comparison with butter vs. shortening here if you’re interested. I was curious to see if I could make a dairy free buttermilk substitute this way, thinking that coconut milk is rich and thick. The consistency ended up being very similar to real buttermilk, which made me excited. 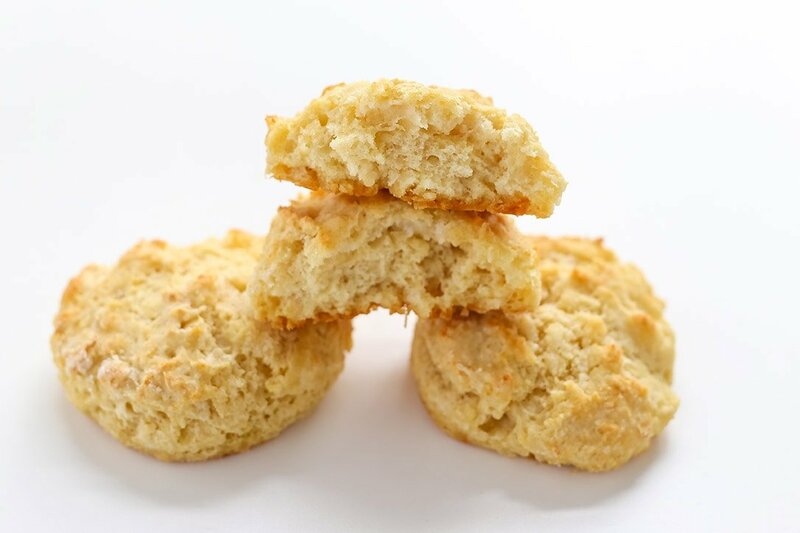 However, the resulting biscuits had a completely different flavor profile from all of the other biscuits and were way more crumbly. These were definitely not my favorite. 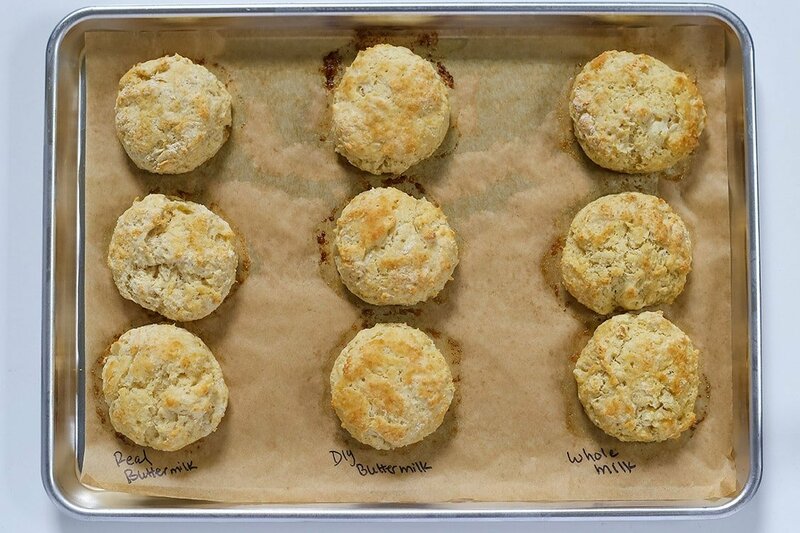 It’s funny because I feel like the biscuits appear to look very similar, but there were definitely noticeable differences in taste and texture. 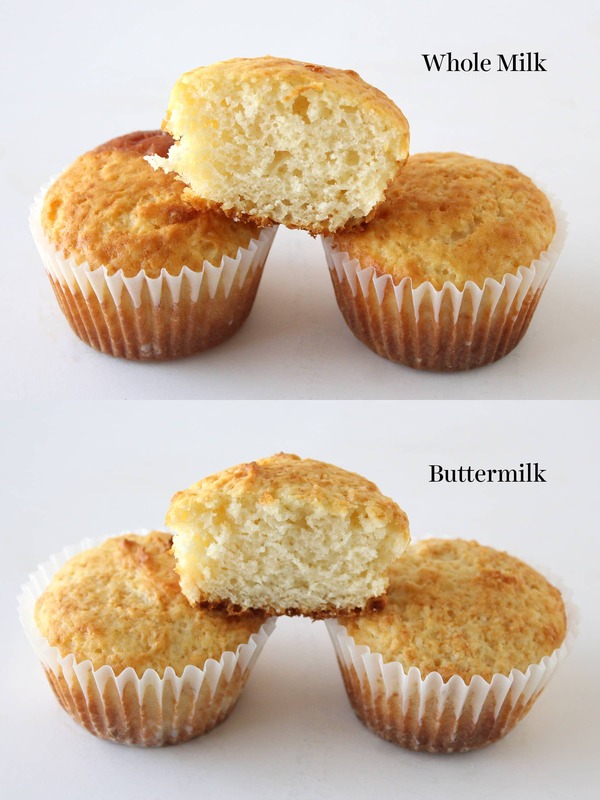 The buttermilk muffins had a finer crumb texture than the whole milk muffins. The buttermilk batch was SUPER moist and flavorful. I absolutely loved this batch and don’t think I’ll make muffins without buttermilk again. You can see my full Ultimate Guide to Muffins posts here. In the bowl of a food processor, combine the flour, sugar, baking powder, baking soda and salt. Cut the butter with a pastry blender until it’s broken up into chunks slightly larger than peas. The faster you do this the better, you want the fat to remain cold. Stir in the buttermilk until just combined. DO NOT overmix, the dough will be slightly sticky. Turn the dough out onto a floured surface and dust the dough with flour. Gently pat the dough out until it’s a 1/2-inch in thickness. Use a 2-inch round biscuit cutter to push straight down through the dough to cut out circles, try not to twist the cutter. 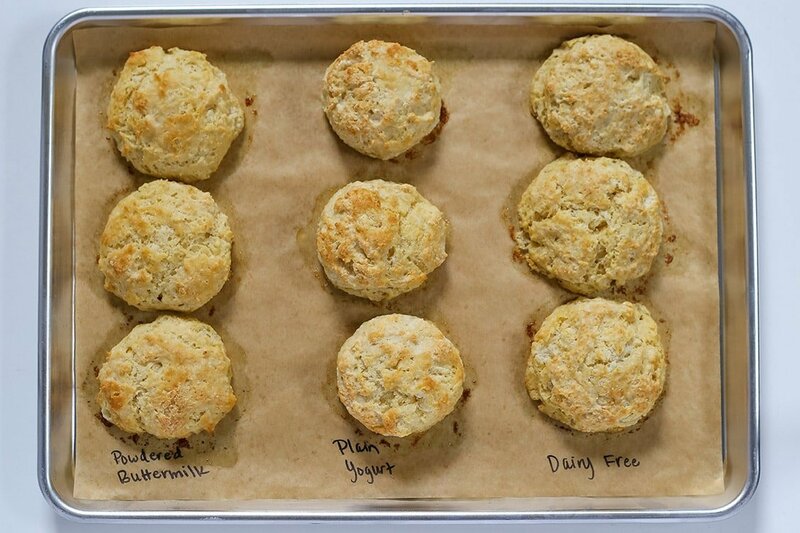 Place the biscuits on the baking sheet, spacing 2-inches apart. Reform the scrap dough into 1/2-inch thickness, being sure to work with it as little as possible, before cutting out more circles. Hi Tessa, this is such a wonderful guide. I often won’t even consider recipes calling for buttermilk but now I can give them a shot! With your yogurt substitution do you recall exactly how much water you added to the Greek yogurt? This is a particularly useful guide. I’m disappointed that the buttermilk powder didn’t yield good results, that would have been so handy! As I’ve only seen buttermilk in quarts, do you know if it freezes well? 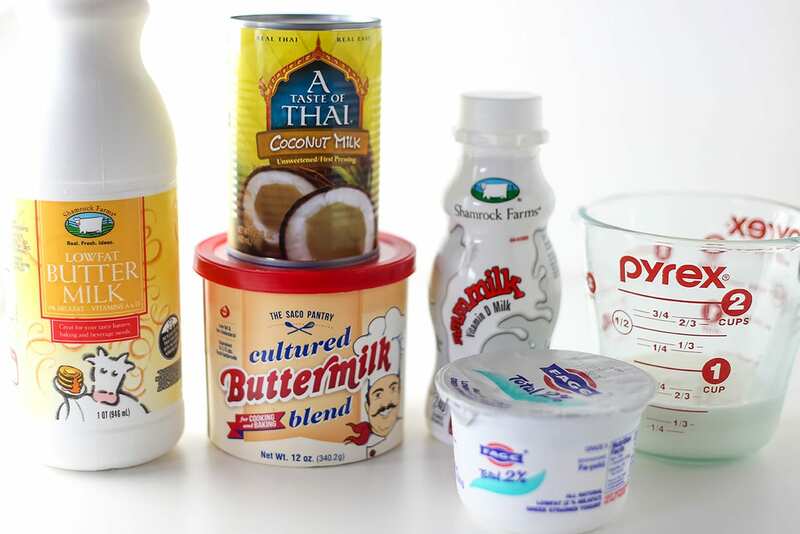 Also, thanks for including coconut milk, my son is vegan, so that would have been a waste of my time and money. I know :/ Yes, buttermilk does freeze well! You can freeze it in ice cube trays. You’ll want to vigorously whisk or blend the buttermilk after thawing before using because it will separate. Amazing! Send your resume to America’s Test Kitchen. The work that you put into this for all of us is very much appreciated. It is so thorough, easy to understand, and beautifully displayed. Awe, thanks so much Amanda! Such a valuable resource, have always needed to know more about buttermilk as an ingredient but don’t use it enough to really get a handle on it, certainly not enough to have done all of the research in this article, so thank you for this valuable info! These tests are very useful, thank you for conducting them. When we live outside the US, some ingredients are hard to find. Here in Brazil we do not have buttermilk, I’ve always used the milk+vinegar substitution. I’ve never tried the yogurt substitution, I’ll give it a try. But I was wondering if thinning it with low fat or whole milk would be better than water. Have you ever tried it? I found water worked best to thin it to the right consistency. I enjoy these guides so much….thank you! I’ve read lemon juice (in place of vinegar) and milk is another common buttermilk substitution. Have you ever tried it? Would it be similar to the milk/vinegar sub? Yes, Sandra, that’s basically the same as the vinegar version. This was so interesting! I love these types of articles! Keep them coming! This was so helpful! Thanks Tessa! Also, I love how you suggested to first try be recipe exactly as written so you know what it’s supposed to taste like. Awesome advice. Thanks again! I’m so glad you thought so, Nathalia! I was very interested in reading this article as I’ve always made my own buttermilk (I don’t use it often enough to keep a carton in the fridge). But I’m wondering if lemon juice would have a better flavor than vinegar. The way you describe the taste is exactly how I imagine DIY with vinegar would taste (I use lemon juice myself). Have you ever done a side-by-side comparison with the two methods? Hardly any difference, Katie. The taste AND texture of *any* DIY version vs the real thing are very different (even if directly sipped for taste side-by-side without baking).